August 10 marks the 57th anniversary of the start of the chemical warfare program in Vietnam in 1961 without sufficient remedial action by the U.S. government. 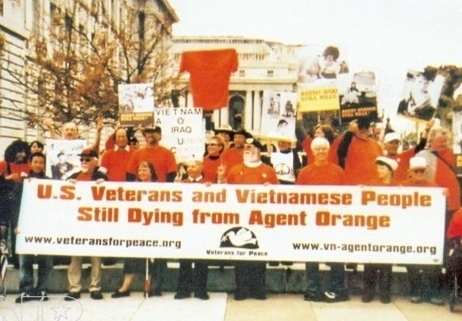 One of the most shameful legacies of the Vietnam War, Agent Orange continues to poison Vietnam and the people exposed to the chemicals, as well as their offspring. Over the course of the its war of aggression, the U.S. military dropped over 20 million gallons of deadly chemical weapons – primarily Agent Orange, but also Agent Purple and other toxic chemicals – on the Vietnamese people with devastating results. Much of it was contaminated with dioxin, a deadly chemical. Dioxin causes various forms of cancers, reproductive illnesses, immune deficiencies, endocrine deficiencies, nervous system damage, and physical and developmental disabilities. In total, over about 4.5 million acres of South Vietnam, Laos and Cambodia were saturated. This campaign killed or maimed 400,000 Vietnamese and lead to 500,000 babies being born with debilitating birth defects, in addition to devastating the economic life of the Vietnamese countryside by destroying all plant life that the chemical contacted. As of 2003, 650,000 people were also suffering chronic conditions, especially cancers, caused by these chemicals. All in all, in Vietnam more than three million people, and in the United States thousands of veterans due to their exposure in Vietnam, their children and grandchildren, have been sickened, disabled or died from the effects caused by these chemicals, especially cancer. Vietnamese-Americans and Vietnamese-Canadians exposed directly to Agent Orange and their offspring suffer from the same health conditions. Vietnamese of least three generations born since the war are now suffering from disabilities due to their parents’ exposure to Agent Orange or from direct exposure in the environment. The organization representing Vietnam’s victims, the Vietnam Association for Victims of Agent Orange/Dioxin, has set up some“‘peace villages” to care for the severely disabled, but many more such facilities and services are needed. Dioxin residues in the soil, sediment, and food continue to poison many people in 28 “hot spots” in southern Vietnam. After years of courageous resistance against every form of criminal aggression by the U.S. invaders, the people of Viet Nam succeeded in chasing the imperialists from their land and won total victory in 1975. In 1954, the Vietnamese people had already completely defeated the French colonialists, only to have the U.S. and its agents begin operations against them as early as 1956. The Vietnam War ended with the defeat of US troops in March 1973 and the takeover of Saigon in April 1975 . In 1976 , Vietnam unified and took the name of the Socialist Republic of Vietnam. In spite of U.S. President Richard Nixon’s 1973 promise of $3.25 billion in reconstruction aid to Vietnam “without any preconditions,” the Vietnamese and Vietnamese-American victims of the criminal chemical warfare the United States conducted in Vietnam have not seen one penny of compensation. While the U.S. government has begun to fund environmental cleanup in Vietnam, it has refused to recognize its full responsibility to heal the wounds of war and provide assistance to Vietnamese, Vietnamese-American, and U.S. victims for the serious health and environmental devastation caused by Agent Orange. The first tests of the herbicide were carried out at the beginning of 1940 in the United States, specifically in Fort Detrick (Maryland), in the US Air Force base Elgin (Florida), in CFB Gagetown, New Brunswick, and in Camp Drum, New York, on the border of Canada. Other tests were conducted in Thailand in the early 1960s. In 1966-67, defoliants, including Agent Orange, Agent Purple and Agent White, were tested at Canadian Forces Base Gagetown near Fredericton, New Brunswick. The sites were located in a remote, 33-hectare forest containing both deciduous and conifer trees. Hundreds of Canadian soldiers and residents in the vicinity of CFB Gagetown in New Brunswick were also affected, as well as members of the U.S. Maine National Guard, who were deployed to participate in war games at the base according to the NORAD and NATO treaties. (It was also used by Ontario Hydro.) However, at the time of the Gagetown spraying, the Pearson Liberal government denied that the chemicals were harmful. However, more and more people drew the warranted conclusions over the ensuing years about the aims of Canada and the official cover-up, leaving it less space to manoeuvre. Finally, in 2007, the Canadian government, in the face of unremitting protests and a legal class action suit by veterans, admitted to working with the United States military in testing the herbicides Agent Orange, Agent Purple, Agent White and other unregistered pesticides at locations around CFB Gagetown in the late 1960s and began paying one-time settlements to its own veterans who served on the base. The settlement was a maneouvre to continue to deny responsibility by the United States; by agreeing to the payments, the Harper government avoided an incriminating trial in which the real ties between the U.S. and Canada would have come out on the public record. The Canadian government since the beginning of the American aggression against the Vietnamese people had a greater share in this violation of international law than any other government in the Americas. Every military escalation of the USA was followed by an escalation of Ottawa’s support for Washington and the puppet regime in Saigon. As immediate payment for this, Ottawa expected the support of the American government for an increased role of as “middle power” in the imperialist system of states. For their huge contribution to world revolution, the people of the world hold in highest regard the Vietnamese resistance, the leader of Viet Nam, Ho Chi Minh, and the other revolutionary Vietnamese fighters. The aggression of the United States destroyed the country but today it is one of the most prosperous nations of Southeast Asia, thanks to the intelligence and industriousness of its people led by the Communist Party of Viet Nam. Fifty seven years is long enough. It is high time to compensate the victims for this shameful chapter in the history of U.S. crimes against humanity.